ALL MICROWAVE SIGNALS currently used for wireless technologies meet Bradford Hill criteria as a Group 1A confirmed human carcinogen. 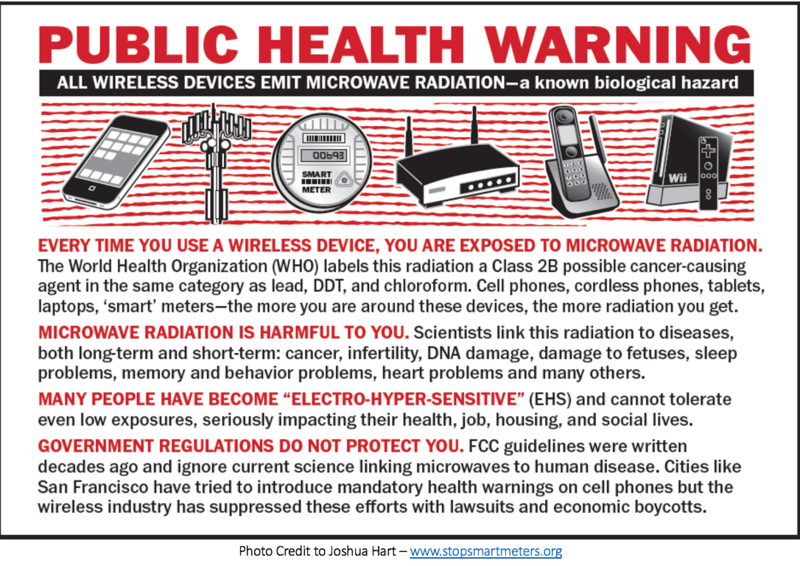 We now have ironclad confirmation that microwave signals are as efficient at producing malignancy as all other 1A carcinogens, including: tobacco smoke, Agent Orange, nuclear fallout, X-radiation and asbestos. Over 50 human epidemiological studies and two large animal studies clearly demonstrate that wireless radiation, propagated at frequencies under 8 GHz, induces cancer in both man and beast. The link below titled Evidence for Cancer provides irrefutable scientific confirmation. These studies and reports, presented together as a unit, are vital to our work and give us the power to defend ourselves and demand our human rights. For thirty years, wireless has been cancerizing, diabetes-izing and lobotomizing the human race with 2G, 3G and now 4G antennas that poison the environment with frequencies under 8 billion hertz. These are centimeter microwaves which span inches to feet as they infiltrate our bodies and flip the polarity of our cells millions to billions of times per second (the digital version of shaken baby syndrome). Now here comes 5G that will co-exist with 4G/LTE radiation, while adding a tsunami of millimeter waves so tiny that they span only a fraction of one inch. 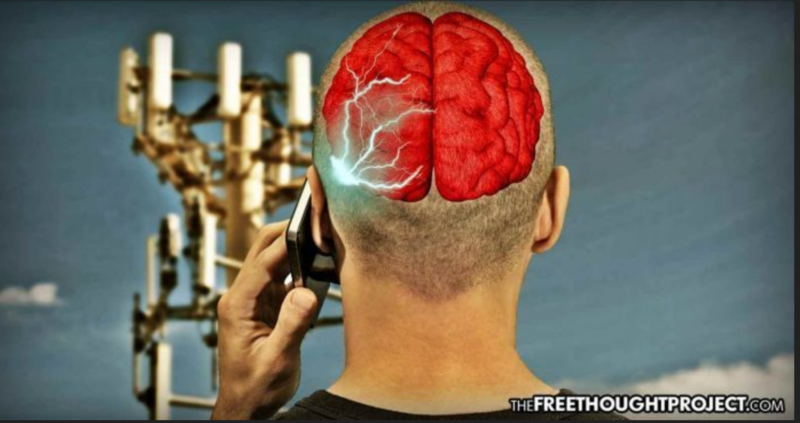 These new 5G frequencies will abuse our bodies with 24-100 billion hertz. The Wireless Radiation Industry is not content with mass human addiction to their deadly wireless technologies. It’s now in frenzy to secure the addiction of 20 billion inanimate objects (by the year 2020, according to Verizon). Through the Internet of Things, appliances, industrial machines, consumer items on the shelf and systems that make cities work (transportation, utilities etc) are slated to become dependent upon the lucrative and toxic pollution of 4G/5G antennas. Verizon and AT&Tumor are in the 5G lead right now. “Serving” 112 million wireless customers, Verizon is aggressively infiltrating cities and towns in our area to make deals for the placement of thick networks of small cell antennas to be mounted very close to the ground on utility poles and buildings. As hundreds of thousands of these small cells go up in metro and suburban neighborhoods, most will be blasting additional 4G radiation to augment cell tower signaling. But the day will soon come when many of these 4G small cells will be switched to steerable, phased array antennas designed to rapid-fire, laser-like millimeter waves upon our hapless population. This article shows what Verizon is doing in Spokane Valley City to secure preparatory 5G small cell sites with the compliance of bureaucrats and city officials. Verizon now has access to 5G millimeter waves in the 28 and 39 GHz bands, as approved by the FCC. These waves are embedded with voice and data information –the Morse code of wireless– and it is these jagged pulsing signals that make the carrier waves so harmful to human tissues. Because millimeter waves are ultra short, they vibrate, rotate and flip the polarity of living cells even faster and more violently than centimeter waves. While the 2.45 GHz Wi-Fi delivers microshocks to our cells 2.4 billion times per second, Verizon’s beamformed 5G waves at 28 GHz and 39 GHz deliver over 10 to 16 times more microshocks per second than Wi-Fi. No one yet knows exactly how this insane bio-agitation will intensify the carcinogenicity of 5G waves, nor how much faster our bodies will sicken and succumb to malignancies under such chronic exposure, added to our already carcinogenic environment. Right now, Verizon is running 5G media ads praising itself for its new small cell projects and also for making “cell tower changes” that will accommodate the Internet of Things. As of October 2018, Verizon has been offering human test rats free trial runs for 5G home (fixed) broadband. The lucky winners are in Sacramento, Houston, Indianapolis and Los Angeles, which means that millimeter wave antennas are active in those areas. AT&Tumor is also launching trial run 5G services in 23 metropolitan areas across the U.S. This means that the new small cell 5G antennas, located close to the ground and only meters apart in populated areas, will be far more powerful and body-penetrating in carcinogenic energy than the older cell tower antennas ever were! In 2019, Verizon will offer 5G mobile services to coincide with the first 5G mobile devices coming onto the market this year. Several phone providers will be selling 5G phones, but since the nationwide 5G antenna infrastructure is barely under construction, the phones will be advertised as 5G-ready and will mainly interact with 4G antennas. However, the Industry has just figured out how to embed tiny beamforming millimeter wave antennas within the metal casing of a phone. Once on the market, these rapid-fire weapons will blast 28 GHz directly into the human brain of any human moronic enough to place it on the skull. Knowing what we do about the cancer-causing microwaves frequencies of 600 MHz to 6 GHz (currently limited in the USA to a device SAR of 1.6 watts/Kg) it seems safe to conjecture that addiction to self- immolating one’s brain with up to 20 watts of 28 GHz may soon rid the world of countless Wi-worshippers. Here is a link explaining how Chinese engineers are developing a true, first generation 5G phone. We have been told that millimeter waves are comparatively weak and cannot travel far. We’ve been told that’s why the USA need millions of new, in-your-face radio antennas spaced only meters apart. And we are told that millimeter waves do not penetrate the body beyond the skin. But watch the Verizon YouTube below, revealing how powerful millimeter waves actually are, how they travel far distances through walls and foliage, how they scoot around buildings to deliver their beamforming carcinogen. If they blast through walls and bounce around structures, these tiny waves will certainly blast right through our flesh without mercy. Below is an additional report titled: Millimeter Waves Travel More Than 10 Kilometers [6 miles] in Rural Virginia 5G Experiment. This article provides info about the 5G coven working at New York University to facilitate delivery of 5G carcinogen upon all creatures and people in rural areas, no matter where they may be “hiding” to avoid exposure. NYU engineers were working with 73 billion hertz (GHz) in this experiment. This frequency, micro-targeted at rural areas, will deliver 73 billion carcinogenic microshocks per second to all living flesh. Did you think you’d see the day when the US government, working with American corporations and universities, would implement this kind of savage weaponry against their own people? Apparently, DARK FORCES wish to bring all of natural creation to its knees. People across the nation already report a strange absence of wildlife, the abrupt disappearance of many insects and trouble with fruit pollination. As we all know, microwave radiation is very hard on bees and birds and scientists are now explaining in detail how tiny 5G millimeter waves will likely finish them off, especially insects. The Natural World will not be missed by 5G madmen. From what we can tell, the main focus of the Wireless Age seems to be the merger of surviving humans with THE MACHINE. Wi-peddlers boast that 5G will greatly advance robot and artificial intelligence technologies. Thanks to 5G, “The world itself will become way more robotized,” announces a spokesman for Intel. Observers believe that we are entering a post-human era in which robots, drones and artificial intelligence gain ascendancy while humans (cyborgs) are methodically reduced to cognitive deficiency and slavery. Our escalating autism epidemic and the two British articles linked below provide evidence of such a masterplan. In December 2018, two congressional leaders actually expressed health concerns about the 5G experiment.